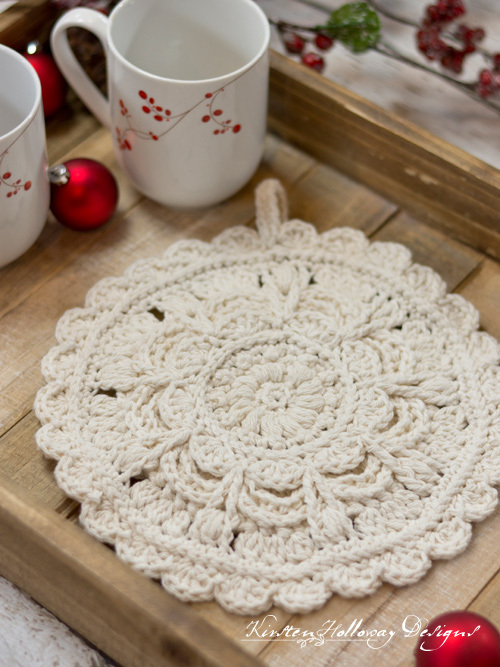 Crochet an elegant hot pad to set your holiday dishes on this year. This beautiful round hot pad is thick yet lacy protecting your table and counters from too-hot dishes.These are perfect for Christmas gift giving, and is sure to be an item that will get lots of “ohhs” and “ahhs” at holiday parties. But you don’t need to keep this just for special holiday parties, use this crochet hot pad year round for the small everyday-moments that are worth celebrating. Better to use this hot pad to it’s full potential than have it sit in a kitchen drawer for the next 15 years, afraid that you’ll ruin it if it sees too many dinners. 😉 Life is worth celebrating, you deserve pretty things no matter the occasion, and yes, I hope you feel a virtual hug through this message. Please read the “additional notes” section for ways this crochet hotpad should and should not be used before beginning this pattern. 100-120 yards #4 worsted weight Cotton yarn –> try Red Heart Scrubby Smoothie. Picot sc = Insert hook, yo, pull up a loop, [yo, draw through 1 loop] 3 times to make a ch 3, then yo, and draw through last loop on the hook. Finished piece is 9″ across excluding loop. -This hotpad is not to be used a an oven mitt or potholder to pick up or remove hot dishes from the oven. It is only meant to set hot dishes on after they are done cooking. -Cotton will scorch at 450 degrees F so if you have been cooking a dish at temperatures hotter than 400 F, please wait several minutes for the pot to cool down before setting it on this pot holder. –ONLY use Cotton yarn for this project. NEVER use acrylic yarn for hot pads because it will melt. Your project will probably cup a little at this point, just hang in there. It’s going to get worse before it gets better. Your project should start laying flat after this round. Do not cut yarn yet unless you want to skip the loop! ch 13, sc in second ch from hook and in next 11 sts. I’m sorry you’re still having trouble. In round 8 you will be chaining 5, then slip stitching around the BPsc stitches you made in round 6 (these line up with the spaces [sl sts] between the shells you made in round 7). You will end up with a ch-5 space behind each shell. 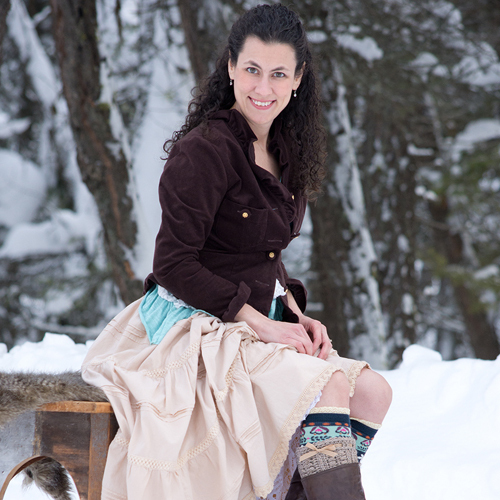 I am out of the office until New Years, so if you have additional questions I will answer them after I return. I hope this helps clarify better! I do not understand 3dc cluster. Is that 3 dc in same stitch? Pattern says dc3tog. In row 12 there are 18 fpdc and 9 puffs and 27 3dc clusters (81 stitches) for a total of 108 stitches not counting the ch1 spaces. So in row 13 it says to 2 sc in first stitch and sc in next 4 for a total stitch count of 108. Doing that will increase the stitch count, not keep it at 108. So I sc in each stitch, not the ch 1 sp and it gave me the required 108 stitches for the row. Is that correct? I am confused with the directions. 18+9+27=54, the ch-1 sps after the FPtr st and between the 3 dc clusters add an extra 36 stitches, equaling 80 stitches for round 12. Remember that clusters are the same as a dc3tog in the same stitch, not 3 separate dc sts. This could be throwing your stitch count off if you are making 3 separate dc stitches where you are only supposed to be putting 1 3 dc cluster. You will then increase to 108 in round 13. I hope that helps clarify! Yes, that is what I was doing. Thank you so much for your prompt response!!! Loving the challenge, it’s a lovely pattern. Row 8 is worked from the back, is it just that row, or do I work from the back from there on? Thats the only one! You will make the loops for the petals on the back–everything else is worked on the front. Just seeing and Im at Awww !! its incredible, design is Way out of my comfort Talent but will sure try. Thank you. You’re very welcome! Good luck on making it!